Is your lawn starting to look patchy and the grass is going a bit yellow? Now is the time for you to act and prevent any further damage to your lawn. Neglecting it can lead to unpleasant and costly repairs. Hire Gardening Services Manchester to enjoy a gorgeous green lawn, as well as a nicely free schedule. Your gardeners will trim all overgrown vegetation, mow, aerate and feed your lawn to keep it healthy for longer. Proper care greatly improves the thickness of your lawn. Regular mowing gives you that dense green grass cover and makes your garden the place where you want to spend your free time. Your gardening teams will use only the latest tools and techniques to provide you with a well kept and tidy lawn. 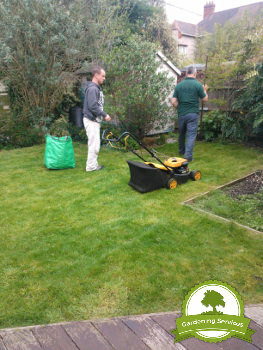 All you have to do is to call 0161 823 0201 now and schedule this lawn care service for a day and time of your choice. Getting on with your lawn maintenance right now is your greatest option towards and impeccable curb appeal of your house. Domestic property owners, as well as commercial ones, can benefit from competent weeding, mowing, aerating, feeding and watering of their lawns. The final result - tidy garden space, kept in its evergreen state. But perhaps you just rented or bought the house, or went on a vacation for a long time and simply need help with your lawn mowing? Enjoy the full capabilities of this lawn care service as a one-off or on regular appointments (weekly, bi-weekly and monthly) whenever you want a garden that fully suits your expectations.